Home / Painting Classes / Parent’s Night Out! after the great success of last months parents night out, we have just opened up a new date, on Jan 22 from 7pm-9pm! drop off the kids, and we will host an amazingly fun painting party event for them, that is 2 hours in length. We transform the studio into a party atmosphere with todays top 40 hits, colorful LEDs and a dozen or so friends. Our professional instructor will make sure that they have a blast as well as learn expert art techniques, learning to recreate The Giraffes painting!. Drop off the kids a few minutes early, and enjoy a night out with friends or a dinner date! It is sure to be a hit, and your child will be talking about how much fun they had for weeks to come! 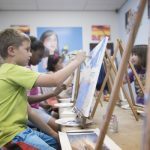 also, these events are great for kids to meet other King Art Studio students and siblings, who share similar interests and live in the surrounding communities. We price these special events very affordable to ensure that everyone can attend and have a wonderful night out. This session, we will be recreating a vibrant and challenging piece that is sure to capture the imagination of the artists. for more information, check out our website online, and booking can be done right from there! Only $19 per child! use promo code 19Art to get tickets discounted! For any inquiries, please call our studio directly anytime to learn more.